V0603. 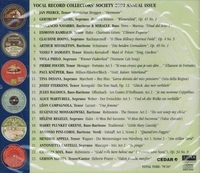 VOCAL RECORD COLLECTORS' SOCIETY - 2002 Issue, incl. Förstel, Navarro, Miracle, Philo, Fouchy, Rambaud, Boons, Damayev, Regelly, Desana, Knüpfer, Sterkens, Baldous, Marturell, Mossakowski, Antonio Pini-Corsi, Campagnola, Appels, Castelli, Soix, Middleton, Greene, Sirota & Jan Peerce (the latter singing in Africaans!). VRCS 2002. Transfers by Seth B. Winner.